To some, it’s that perfect niche that they’ve been searching for in order to take that next step and grow as a dancer; to others, it represents the continuation of an alarming trend heralding abomination and the desecration of their art-form. Gothic Belly Dance, or "Raks Gothique" as many of its aficionados fondly call it, merges the styling of the Gothic or "Goth" subculture from the last 20 years with the beautiful expression of Middle Eastern Dance in both cabaret and tribal formats. Hence, it is a fusion form of belly dance, and is also used as an umbrella term for related forms like experimental, ritual, and sacred belly dance. This may come as a shock to many, but Gothic Belly Dance isn’t really a new phenomenon, and it’s not just centered in California. First of all, it’s simply a merger of two entities that go well together, like peanut butter and chocolate. Goths love shiny things, elaborate costuming, passionate music, and being dramatic. Belly dancers love shiny things, elaborate costuming, passionate music, and being dramatic. Sooner or later, the two camps had to meet, and the Gothic Belly Dancer emerged. And not just in one spot, but throughout the United States, Europe, Japan, and Australia. Media & Society: First off, events of the last decade have brought the Gothic subculture to the media’s attention (for better or for worse). Most of the initial profiling was off in left field (like we as belly dancers should be surprised that the media sensationalizes its news...*gasp*), especially with the shootings at high schools, alternative religion discrimination, etc. Toss in a few vampire and occult movies, and bam, there’s a trend! To make a long story short, although Goths have been around for the better part of two decades (and, some would argue, longer), it’s a movement that ebbs and flows and gets revitalized as the scene develops, changes, and attracts a new generation, who bring their own flavor to it. From Anne Rice and her vampires to movies like The Matrix, The Crow, Nightmare Before Christmas, and Underworld, to bands like Evanescence and stores like Hot Topic and Torrid bringing the music and the clothing mainstream: all are influences on general society and subsequently cause an influx to the Gothic crowd - a little light in the shadows, if you will. Goths & Dancing: Out of all of the modern subcultures out there, you’d be hard-pressed to find any as obsessive or enthusiastic about dancing to their music and dressing in their high fashion as the Goths. Going to a Goth night is like going to your own private fashion show, where everyone gets up to dance. And while most regular folks may find the dancing at the clubs a tad odd in style, it’s truly a celebration of individuality, where everyone does his or her own thing, and they’re there to dance, socialize some, and dance some more. Freedom of Movement: I think the biggest reason why Gothic Belly Dance seems to be emerging now is that there have been a lot of groundbreaking changes in the whole belly dance community over the last decade, especially in regards to fusion and the people who perform it. From long-respected dancers like Dalia Carella and Suhaila Salimpour to emerging ones such as Rachel Brice and Desert Sin, there are new standards being set, rules being broken, and challenges being made. Another major factor is the development and astounding growth of American Tribal Style dance. It has been well documented that ATS and related Tribal Fusion provided (and still do) an excellent outlet for those who look more alternative (tattooed, pierced, unusual hair, etc) and may not have originally felt comfortable in more traditional classes. So with the gradual acceptance and visibility of alternatives to more traditional forms of belly dance, a new atmosphere for inspiration is created. Dancers who were afraid to do something that was outside of the “normal” for fear of being ridiculed by their teachers or fellow dancers are now feeling more courageous to be themselves. GBD can be performed to appropriate Middle Eastern music, which we know represents a diverse number of cultures and expressions, but in addition to that, a great deal of the music found in the Gothic category incorporates Middle Eastern, Near Eastern, and Far Eastern instruments and vocals. For the most part, it’s not your basic Western popular music, and can be very similar in sound and beat structure to what we consider standard belly dance music. Likewise, the attitude of the belly dance movements may take on a different personality, but they still share the same base structure. Of course, there’s the whole issue in the larger community about the name "belly dance" itself. Without leaping onto that battlefield, it should satisfy most that the term “belly dance” is used to describe this dance, rather than Middle Eastern Dance, Raks Sharki, Danse Oriental, or whatever term. GBD doesn’t claim to be any of those specifically. Authentic compared to what? Another whole mess, but again, GBD isn’t advertised as anything but what it is. (Are we still talking about GBD here?) I can’t speak for every Gothic Belly Dancer out there, but I know that I dance to what moves and inspires me. And it’s the need to express and celebrate that feeling that is the basis for performing. I’ve also been the sort of person who likes to push limits—it’s an integral part of my fine art training, as well as part of my upbringing. I’ve learned that those who want to be offended, will be offended, whether you intend it or not. 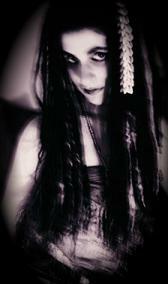 -even dancing to non-traditional music in my gothic costuming, the belly dancing still comes through loud and clear. there is a certain presence and level of skill necessary to really pull it off…which is really what makes a good fusion: a strong understanding of what you’re putting together, including technical proficiency, stage presence and personality. It is my hope that the Resource will help educate everyone interested in GBD and will inspire them to strive to do the best they can. We are all responsible for whatever dance form we represent. Begun in the mid-1970's , the early sections of "Sirat Al-Ghawazi" were first published under the title "The Mystery of the Ghawazi." We are happy to be able to respond to the continued demand for these articles by making them available to our readers worldwide. Biram, Clare, Cynthia, Krista, Lynette, Michelle, Monica, Sandra, Valentino, Yasmine and probably more! Belly dancers are the hottest trend at the moment, unlike the totally frozen attitudes towards the Arab culture in Israel.